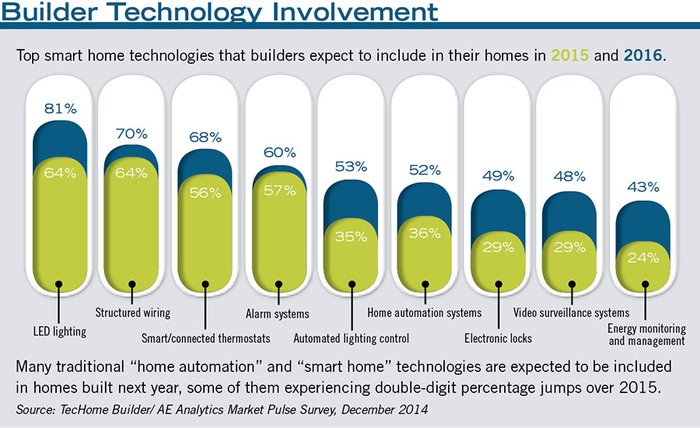 Smart home technology is playing a bigger role in new home sales today. And it isn’t just for multi-million dollar homes anymore. Homebuyers in the $200,000 - $300,000 range have interest in smart home technology too. Additionally, can it help sell your homes faster and, for a premium? A recent survey of more than 500 real estate professionals found that nearly two in three of the sales associates surveyed agreed that buyers today are more interested in homes with smart home features and technologies than they were five years ago. inhoome has helped builders transition to the best and latest Smart Home Technology with which not only home buyers enjoy the security and technology that comes with every home, but they actually use it everyday because, among many other benefits, it gives them the ability to save on energy bills and manage the technology in their homes from their mobile devices. Unlike other security and technology companies who either install the equipment or provide services, we take a turnkey approach and help the builder design, market and sell the solution and options, and after the homeowners have moved in, we provide Smart Home and Alarm services 24 hours a day and 365 days per year. DO YOU INCORPORATE ANY OF THE FOLLOWING IN YOUR NEW HOME CONSTRUCTION? Contact Inhoome today to learn more about how we can help increase your new home construction home sales. *For every referral that results in the sale of a monitored alarm system, we will give you $100!